Home Improvement Specialists of Cape Cod, Inc. is a growing remodeling company looking to expand on Cape Cod and Southeastern Mass. If you believe that you are highly motivated with a desire to achieve excellence, then we would invite you to explore the possibilities of joining our winning team. 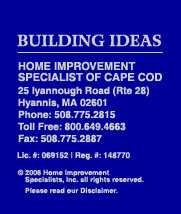 Home Improvement Specialists of Cape Cod, Inc. IS AN EQUAL OPPORTUNITY EMPLOYER.